The sensitivity of marine communities to ocean warming rather than rising ocean temperatures will have strong short-term impacts on biodiversity changes associated with global warming, according to new research. The study, involving scientists from the Universities of Southampton (UK), Stockholm (Sweden) and Tasmania (Australia), found that while some communities – a set of interacting species – are comprised of species that live at the edge of how much heat they can tolerate, others may have a greater tolerance or ‘bias’ to warming oceans. This bias is due to the combination of historical, ecological and evolutionary factors that play an important role in determining which species are found where. By understanding the size of a communities’ thermal bias, scientists will be able to predict and prioritise which areas are going to be most vulnerable to ocean warming. 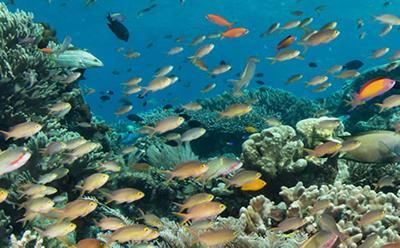 Using data from the Reef Life Survey, the researchers measured the geographical and thermal distributions of 2,695 shallow reef fish and 1,225 invertebrates from Greenland to Australia to measure the thermal bias for communities around the world. They found that locations where the average summer sea surface temperature is presently 24 °C, such as the Gulf of Thailand, southwestern Caribbean and Three Kings-North Cape in New Zealand, are the most vulnerable to changing community biodiversity. This is because most of the species making up these communities are already living near the edge of their temperature distribution. The research, which is published in the journal Nature, was funded by the Australian Research Council and Marine Biodiversity Hub.